With nearly 20% of consumers now supplied by independent energy retailers and switching at record levels, the UK domestic supply market has become a magnet for international firms looking to expand their energy activities. 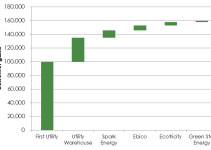 Large traditional utility companies, such as Vattenfall and ESB. Independent challenger brands looking to expand their international footprints. These include firms with existing multi-country operations, as well as those for whom the UK is their first expansion market. Oil and gas giants such as Shell and Gulf, who are extending into the domestic supply arena as part of their preparations for a decarbonised energy future. This article explores the growing presence of international players in the UK’s B2C energy retail segment, identifies their routes to market, and considers the outlook for market development. While the more recent international entrants are for the most part setting up greenfield operations in the UK, Shell and Vattenfall have made strategic acquisitions of growing small to mid-tier players – First Utility and iSupplyEnergy, respectively – to provide a platform for accelerated growth. First Utility is the UK’s largest independent supplier, with around 826,000 customers. As well as the UK business, the Shell deal includes First Utility’s fully-owned German subsidiary, which operates under the Shell brand. Shell has had a close association with First Utility for some years as its wholesale gas and electricity provider. The oil giant has indicated it has ambitious plans for First Utility, stating in the press that the Big 6 should “take notice”. As well as accelerating First Utility’s growth, the acquisition targets the development of new customer propositions that leverage Shell’s energy investments in renewables and electric vehicle charging. These are expected to build on the new business areas that First Utility has already begun developing, such as the connected home. Meanwhile, Vattenfall has bought up iSupplyEnergy, a smaller-scale independent with around 120,000 dual-fuel customers. The Swedish state-owned utility said iSupply’s sustainable growth and focus on innovation provide a good strategic fit for its business. For example, Vattenfall’s investments in wind farms and battery storage in the UK complement iSupply’s commitment to supplying 100% renewable electricity. These acquisitions follow on from the earlier investments by EDF, E.ON, Iberdrola and RWE among the market-leading Big 6 energy companies. A key difference is that by acquiring growing independent suppliers, Shell and Vattenfall will be unencumbered by legacy issues, and can focus on building modern, efficient energy companies using the latest technologies and aligning with the emerging new energy paradigms. Powershop’s UK entry has come via a licensing agreement with npower for use of the antipodean firm’s brand and service platform. Owned by New Zealand’s Meridian Energy, Powershop has made a name in its home region for an innovative approach to selling energy, which sees customers purchase ‘Powerpacks’ of energy credit via an online shop. They then use online tools or a mobile app to track consumption against their credit. There are pricing incentives for paying upfront for energy, but unlike a traditional prepaid plan, customers aren’t disconnected if their usage exceeds the credit they’ve purchased; instead, they pay for any excess consumption at the end of the month using a default payment method. In New Zealand and Australia, Powershop has around 110,000 customers and reports high levels of customer satisfaction. According to Meridian’s CEO Mark Binns, the UK licensing arrangement with npower represents a lower-risk entry strategy for Powershop, allowing the company to generate returns from its technical platform while avoiding exposure to foreign wholesale energy markets and lowering the investment required. Meridian last year spun off the technology platform from the Powershop retail brand to pursue further expansion opportunities for its software and know-how. Some new entrants in the UK have already established large customer bases elsewhere. For example, Green Star Energy is part of the Canadian Just Energy Group, which serves over 2 million customers mainly in North America. Green Star promotes this “trusted experience as part of a larger group” as one of its brand values. According to the latest Ofgem figures, Green Star’s UK domestic electricity market share rose above 1% in Q3 2017, around five years on from the company’s launch. The firm is also a UK business electricity supplier, operating under the Hudson Energy brand. ENSTROGA is another independent whose proposition emphasises its track record in serving energy consumers in other markets. The supplier belongs to a Europe-wide energy group with ten years’ experience. Another UK entrant, Brilliant Energy, is owned by Universal Utility International, whose brands in Germany (Stromio, gas.de and Grünwelt Energie) serve over 1.2 million customers. Extra Energy’s sister brands extraenergie, HitEnergie and prioenergie also collectively serve over a million German households. Beyond energy supply, the Extra group includes generation, trading, telecoms, mobile, billing services, travel and insurance businesses. For several companies, the UK is a first international expansion market. For example, OneSelect is Energieflex’s initial foray beyond the Netherlands, where it has acquired over 100,000 customers since launching in 2014. OneSelect offers a single tariff and aims to combine competitive pricing with good customer service and product innovation. It plans to extend these principles to other services in future, including broadband, mobile and insurance. This strategy could see it in future take on existing multi-service firms such as Utility Warehouse and First Utility. Also taking its first steps in internationalisation is Italian firm Green Network Energy, which has acquired over 155,000 UK customers since launching in late 2016. The company is targeting the 600,000-strong Italian expat community in Britain and has bilingual Italian/English customer service agents. In Italy the organisation has energy trading operations and invests in renewable generation, in addition to supplying energy. Building on its success in Ireland where it has over 130,000 customers, pay-as-you-go (PAYG) specialist PrePayPower has launched in the UK as Avid Energy. The supplier is leveraging smart metering technology to offer an improved, digital prepay experience for consumers. Smart PAYG is a niche where Utilita has already built a 2% market share with over 600,000 customers. Avid also faces competition from several other prepay specialists, including OVO Energy’s Boost Power brand, E, and Economy Energy. PrePayPower is said to be looking at other new market opportunities beyond the UK. More mergers and acquisitions. 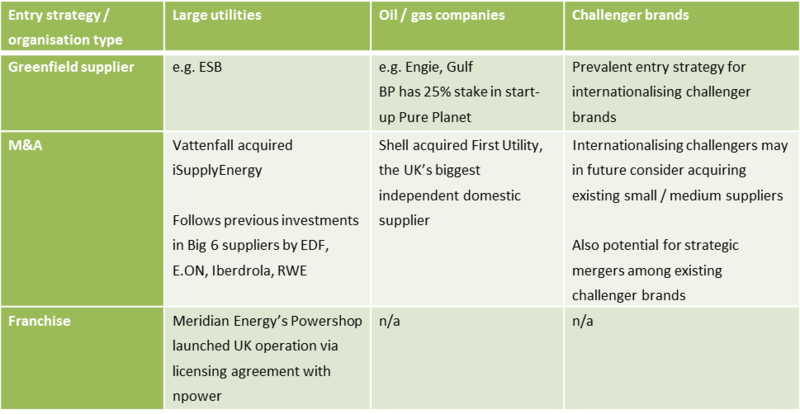 Shell and Vattenfall both opted to enter the UK’s B2C energy retail sector through acquisitions, and we could see other companies replicate this approach in future. A growing number of UK independent suppliers have sizeable bases of over 100,000 customers and could become acquisition targets, not just for international players seeking a UK footprint but also for existing UK independents looking to gain scale, eliminate a key competitor, or create opportunities for cross-selling complementary services. Other oil and gas companies entering the domestic supply market. Shell, Engie, Gulf and BP have taken different routes into household energy retailing in the UK. Unlike Shell, Gulf and Engie have both launched greenfield suppliers, while BP has a minority stake in the start-up Pure Planet. As part of their decarbonised energy transitions, other big oil and gas companies could potentially join them in future. One such candidate could be Total, who is already a major business energy supplier in the UK and in late 2017 entered the French domestic sector with a target of becoming the main alternative to EDF. Total also owns Belgian supplier Lampiris and is eyeing further expansion in the European B2C markets. Meanwhile, Italian giant Eni is expanding its domestic retail operations in France, launching electricity last year as a complement to its existing gas supply business. The growth of new Europe-wide energy brands. Around Europe several ambitious alternative suppliers are building on their home market successes by replicating their business models in new territories. Some of these players are now reaching scale with a million or more customers across their various operations. The most successful could eventually become internationally recognised brands and, with the right strategies and execution, in the long term could potentially grab significant market share.